I often get asked questions about the effectiveness of hypnotism and weight loss as a Consulting Hypnotist at the Queen Elizabeth Health Complex in Montreal. The short answer is a very definitive yes; Hypnotism does work to help you lose weight and keep it off. Both clinical studies and my experience support that answer. More and more people are discovering that dieting does not work for permanent weight loss. In fact, people are typically putting even more weight back on after finishing their diet and feel very discouraged. 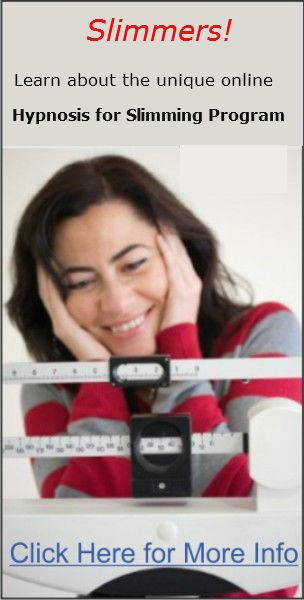 They are realizing that there must be something more to losing weight than just going on yet another diet. And they are right of course. Everyone knows how to lose weight; eat less, eat healthily and get some moderate exercise. but so many of us seem unable to put this apparently simple remedy into practice. That’s because we are driven to overeat by all sorts of emotional issues. There is nothing logical about overeating. We eat because we feel we deserve a reward, because we are sad, stressed, bored or whatever. We eat to distract ourselves away from these feelings. It works on a temporary basis but of course those feelings come back and before we know it we are overeating again and afterwards feeling even worse about ourselves than before. Hypnotism works for weight loss because it allows you to finally change those irrational habits and develop a new relationship with food. In this new relationship you can learn to recognize that food is fuel and to stop eating when you are pleasantly satisfied. Hypnotism can do this because those emotions that drive us to keep overeating (a response that we learned likely when we were young) are part of our unconscious minds. And with hypnotism we have a safe, natural and proven way of communicating with our unconscious minds. This way we can train our unconscious minds to respond in new healthy ways to food. That hypnotism works to help you lose weight and keep it off is supported by both the success clients have in my (and many other) Hypnosis practices along with studies that have been carried out on the issue. For example, the Journal of Consulting and Clinical Psychology, reports on a study of 60 women who wanted to lose weight. They were divided into groups that used hypnosis for weight loss and those that did not. The hypnosis weight loss groups lost an average of 17 pounds while the non-hypnosis groups lost only an average of half a pound. Quite a significant difference I think you will agree. Whether or not people can keep the weight off when they use hypnotism for weight loss was the subject of a study found in the Journal of Clinical Psychology. The researchers compared the longer term results of weight loss groups that used hypnosis and those that did not. The hypnosis weight loss groups had kept the weight of and continued to get good results in a two year follow up to the original study. Meanwhile the non-hypnosis groups had no further results to show for their previous weight loss efforts. The good news is that hypnosis is a completely safe and natural process that any one who wants to can be taught to use and benefit from. You can learn more about making an appointment with me in Montreal. If you would like to find out more about the hypnotism and weight loss online program then you can by clicking on the link. ps...please spread the word if you found this page of help by clicking the FaceBook "Like" button below now. Thanks for your help in spreading the word. Return here from Hypnotism and weight loss to the Weight Loss Hypnosis page. 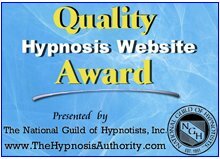 Return here to the Hypnosis Information Home page.